French tosafist; born about 1150; died at Acre about 1230. His birthplace was probably Falaise, Calvados, where lived his grandfather, the tosafist Samson ben Joseph, called "the Elder." Samson ben Abraham was designated also "the Prince of Sens." He received instruction from Rabbenu Tam (d. 1171) at Troyes and from David ben Kalonymus of Münzenberg while the latter was Tam's pupil, and for ten years attended the school of Rabbi Isaac ben Samuel ha-Zaḳen of Dampierre, after whose death he took charge of the school of Sens. Asheri says of him that after R. Tam and Isaac ben Samuel he exercised the greatest influence upon Talmudical studies in France and in Germany during the thirteenth century. Joseph Colon declares that Isaac ben Samuel, Judah Sir Leon of Paris, and Samson ben Abraham formed the three strong pillars of the northern French school. Samson's tosafot, abridged by Eliezer of Touques, are the principal sources for the interpretation of the Talmud. Being recognized as a high authority, Samson was frequently consulted upon religious and ritual questions; and most of his decisions were accepted. He did not slavishly submit to tradition, nor did he consider his opinions irrefutable. "If my opinion does not agree with yours, reject it," he once remarked ("Mordekai," on Ḥul. viii. 718). In his love for truth he once revoked a former decision of his own ("Or Zarua," ii. 175); and with great reserve he decided against the views of R. Tam ("Mordekai," l.c. p. 733) and against those of his teacher Isaac ben Samuel (ib. Pes. ii. 556). But he showed himself very intolerant toward the Karaites, whom he looked upon as heathens with whom Israelites should neither intermarry nor drink wine. Samson sided with the adversaries of Maimonides in their polemics. With Meïr ben Todros ha-Levi Abulafia he kept up a lively correspondence; through Abraham ben Nathan ha-Yarḥi he sent an answer to the letter which Abulafia had addressed to the rabbis of Lunel and Toledo, and said, "I did not come to refute the great lion after his death." But, like Abulafia, he condemned Maimonides' rationalistic views on bodily resurrection and Talmudic haggadah; he likewise sided with Abulafia in his objection to some halakic views of Maimonides, and reproached the last-named for not having indicated the Talmudic sources in his "Mishneh Torah." But later on they quarreled because Abulafia was offended by some of Samson's remarks. Samson refers to Saadia Gaon, whose works he knew not through Judah Tibbon's Hebrew translation, but probably through extracts made for him by Abraham ben Nathan. In consequence of the persecution of the Jews by Pope Innocent III. 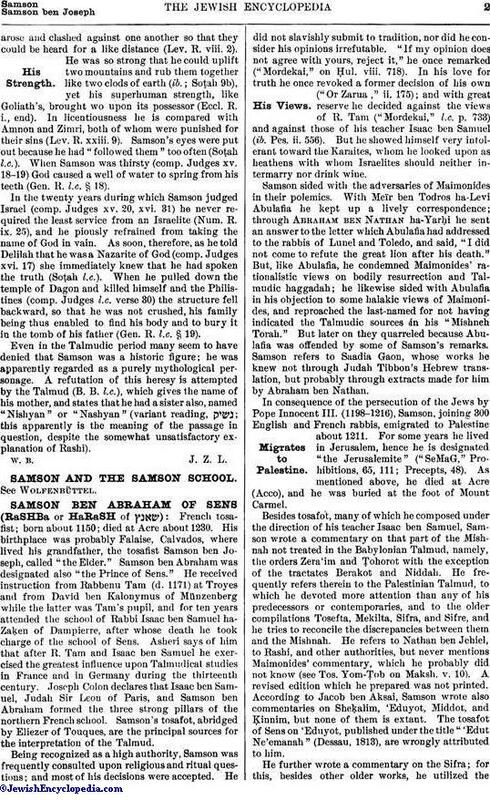 (1198-1216), Samson, joining 300 English and French rabbis, emigrated to Palestine about 1211. For some years he lived in Jerusalem, hence he is designated "the Jerusalemite" ("SeMaG," Prohibitions, 65, 111; Precepts, 48). As mentioned above, he died at Acre (Acco), and he was buried at the foot of Mount Carmel. Besides tosafot, many of which he composed under the direction of his teacher Isaac ben Samuel, Samson wrote a commentary on that part of the Mishnah not treated in the Babylonian Talmud, namely, the orders Zera'im and Ṭohorot with the exception of the tractates Berakot and Niddah. He frequently refers therein to the Palestinian Talmud, to which he devoted more attention than any of his predecessors or contemporaries, and to the older compilations Tosefta, Mekilta, Sifra, and Sifre, and he tries to reconcile the discrepancies between them and the Mishnah. He refers to Nathan ben Jehiel, to Rashi, and other authorities, but never mentions Maimonides' commentary, which he probably did not know (see Tos. Yom-Ṭob on Maksh. v. 10). A revised edition which he prepared was not printed. According to Jacob ben Aksai, Samson wrote also commentaries on Sheḳalim, 'Eduyot, Middot, and Ḳinnim, but none of them is extant. The tosafot of Sens on 'Eduyot, published under the title "'Edut Ne'emanah" (Dessau, 1813), are wrongly attributed to him. He further wrote a commentary on the Sifra; for this, besides other older works, he utilized thecommentary of Abraham ben David of Posquières (RaBaD), which he quotes under the designation "sages of Lunel," "sages of the Provence," without mentioning the author's name. 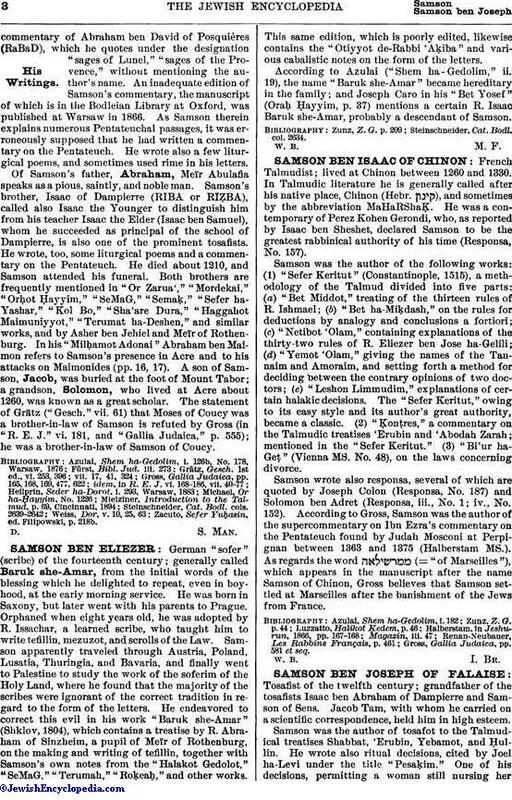 An inadequate edition of Samson's commentary, the manuscript of which is in the Bodleian Library at Oxford, was published at Warsaw in 1866. As Samson therein explains numerous Pentateuchal passages, it was erroneously supposed that he had written a commentary on the Pentateuch. He wrote also a few liturgical poems, and sometimes used rime in his letters. Of Samson's father, Abraham, Meïr Abulafia speaks as a pious, saintly, and noble man. Samson's brother, Isaac of Dampierre (RIBA or RIẒBA), called also Isaac the Younger to distinguish him from his teacher Isaac the Elder (Isaac ben Samuel), whom he succeeded as principal of the school of Dampierre, is also one of the prominent tosafists. He wrote, too, some liturgical poems and a commentary on the Pentateuch. He died about 1210, and Samson attended his funeral. Both brothers are frequently mentioned in "Or Zarua'," "Mordekai," "Orḥot Ḥayyim," "SeMaG," "Semaḳ," "Sefer ha-Yashar," "Kol Bo," "Sha'are Dura," "Haggahot Maimuniyyot," "Terumat ha-Deshen," and similar works, and by Asher ben Jehiel and Meïr of Rothenburg. In his "Milḥamot Adonai" Abraham ben Maimon refers to Samson's presence in Acre and to his attacks on Maimonides (pp. 16, 17). A son of Samson, Jacob, was buried at the foot of Mount Tabor; a grandson, Solomon, who lived at Acre about 1260, was known as a great scholar. The statement of Grätz ("Gesch." vii. 61) that Moses of Coucy was a brother-in-law of Samson is refuted by Gross (in "R. E. J." vi. 181, and "Gallia Judaica," p. 555); he was a brother-in-law of Samson of Coucy. Zacuto, Sefer Yuḥasin, ed. Filipowski, p. 218b.